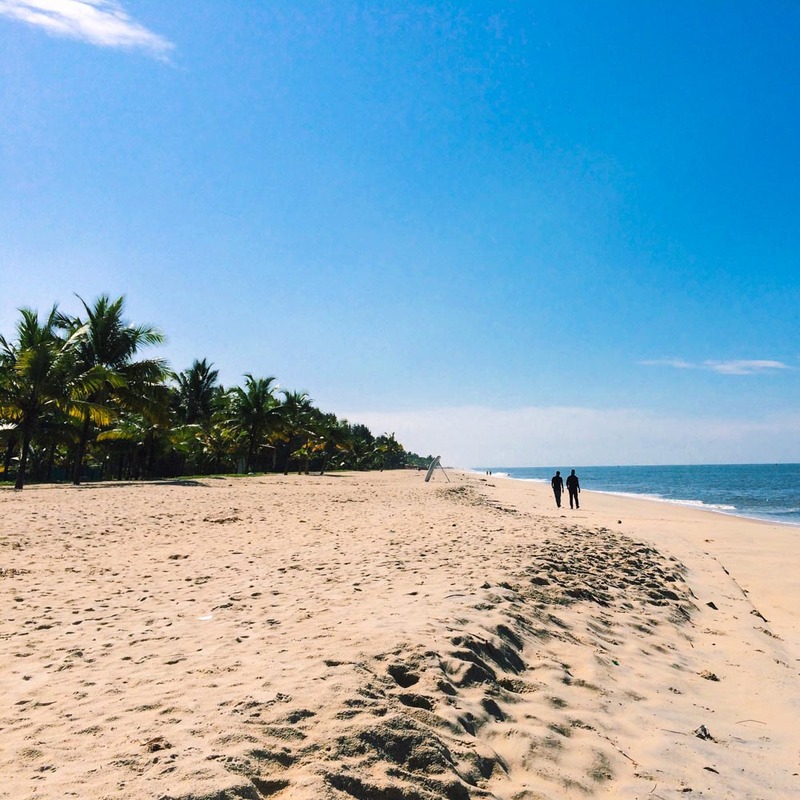 Our trip to Kerala and Goa was a dream – the first time in years that we could truly switch off our computers and simply explore. As such, I put a lot of effort into crafting the perfect Kerala and Goa itinerary. As readers of this site know, we always prioritise finding special things to do and places to stay, and our time in India was filled with incredible finds and experiences. 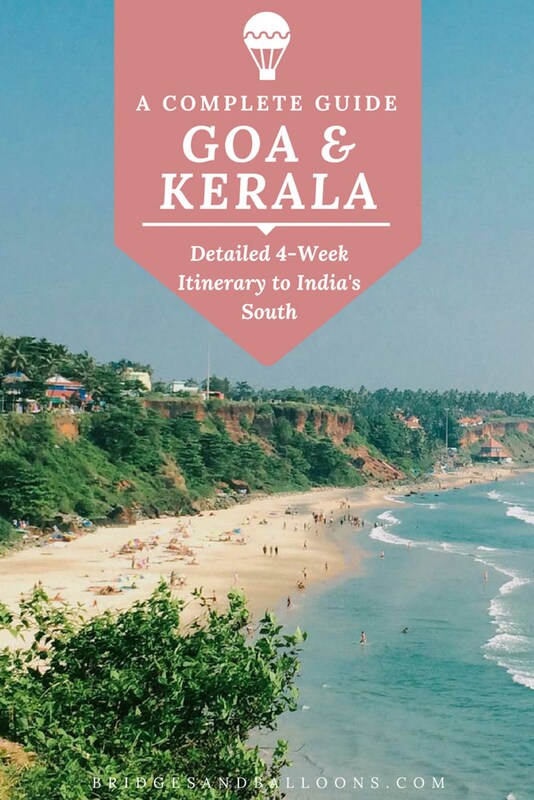 This post is all about the details of our trip – the most special places to stay in Kerala and Goa, how to get around in India, and some of the best things to do with a month in Southern India. Use Clear Trip to book your trains. The aim of our trip was to relax. We weren’t looking for an in-depth cultural exploration or a comprehensive “let’s pack in as much as we can” trip. I wanted a gentle introduction to India and we both wanted time to recuperate after a time of intense stress. For that reason we opted out of anything that would mean a lot of long-distance travelling. We also weren’t on a tight budget. We were happy to splash out (within reason) in the name of comfort and vacation. What we ended up doing fitted the bill perfectly. We left southern India feeling replenished. I know this is unusual for a lot of first timers to India who are often left a little worn out (but enchanted) by the experience. This had a lot to do with us being in Kerala and Goa, which are often referred to as “India light” but it’s also because of the places and route we chose. So if you’re looking for a soft landing in India, I recommend our trip wholeheartedly. I’ve added some travel info for each location, but one top tip if you’re using trains is to book them using Clear Trip. It’s easy to use and about a million times easier to navigate than the Indian Railway website. That said, if you are travelling during the day, we never had a problem just turning up and booking a seat on the spot (that would likely not be the case for overnight trains). For info on Indian train classes, I recommend reading this guide. We generally went with the sleeper class option. The one time we tried an AC chair carriage, we found it way too cold. We flew into and out of Mumbai but only spent a couple of days there. Our first night was down in a budget hostel called Travellers Inn in the Fort area. It was very simple but perfectly clean and well located for exploring some of the main sights and getting a flavour of central Mumbai. We walked from there to see the sunset at Chowpatty Beach, which is a popular hangout for Mumbai locals. One thing to consider when looking for things to do in Mumbai for just a day or so is that the traffic in the city is immense and it can take up to two hours to get from the airport down to the Fort area. For this reason, we decided to stay nearer to the airport on our second night and on our return journey. We chose the coastal Santa Cruz area, which seemed to be very popular with Indian holidaymakers. There’s a lovely theatre there called the Prithvi Theatre with an atmospheric fairy-light-lit garden, which is a good spot for people watching. There was also a man just outside the theatre selling the best street food I may have ever had but I’m not sure how often he’s there. If you don’t find him, there’s a large street food market just a short walk away on Juhu beach with tons of options (that’s where Steve is in the photo above). 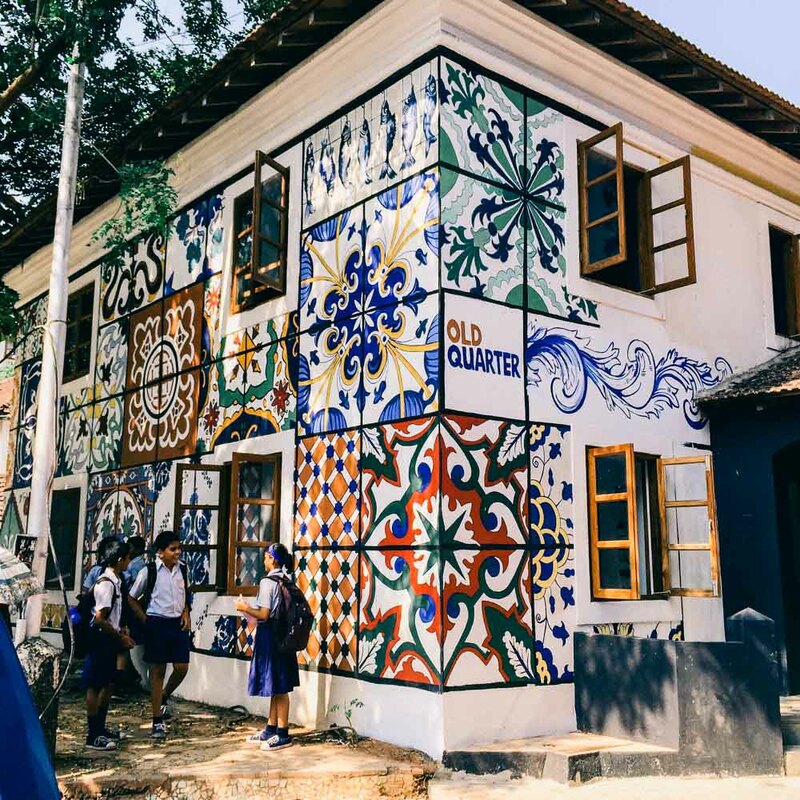 Santa Cruz is about a 15-minute drive away from the hipster area of Bandra West where you can do some Bollywood star-spotting and check out the trendy Mumbai scene. We would have liked to stay in Bandra for a night but struggled to find a good price. If you’re going to Mumbai, I highly recommend reading Behind the Beautiful Forevers by Katherine Boo, which gives an incredible insight into life in the city’s slums, and specifically those next to the airport. Transport: We got a pre-paid taxi from the airport to the Fort Area and then took tuk-tuks or taxis the rest of the time. You can also get buses which are by the far the cheapest option. On the first leg of our journey we took a tuk-tuk from Santa Cruz to the airport, which involved a hair-raising stretch of time on the highway. Next time I’d take a taxi instead as the tuk-tuk felt too vulnerable for such a big road. Note that there are two airports in Mumbai – an international and domestic one. They are only about 15 minutes apart but it’s good to know if you’re on a tight schedule (yes, we did make that mistake!). When we first looked into the beaches of Kerala, we kept coming across an image of a dramatic red cliff, framing a golden beach. It turned out this was Varkala. We made it our first stop in Kerala and spent three days enjoying the beach. There are lots of places to stay in Varkala, but if you want to relax away from the crowds, the charming Ayurvedic resort, Eden Garden is perfect. 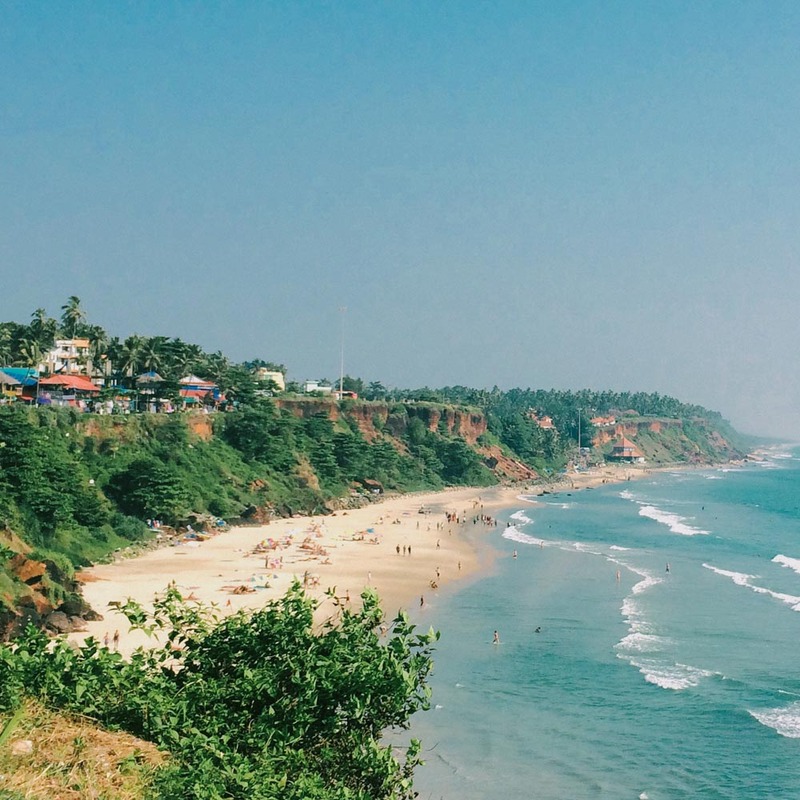 Varkala is a quintessential backpacker destination with cookie cutter restaurants lining the cliffs and lots of fresh (and not so fresh) faced travellers either stopping for a few days or much longer. However, it’s also a temple town and a pilgrimage site for Indian people so it’s very popular with locals, especially at the weekends. Sadly, the beach is somewhat segregated into local / tourist areas (the north being more touristy) and it’s particularly important to respect the local culture at the south end of the beach where holy men are stationed to carry out various pilgrimage rituals. The temple is out of bounds for non-Hindus. Transport: We flew to Trivandrum airport from Mumbai and got a taxi from the airport to Varkala, which cost around 700 rupees. It would have been cheaper to get a tuk-tuk to the train station and a train from there to Varkala, but we decided to go with convenience. Alleppey is the most popular base for exploring Kerala’s backwaters. 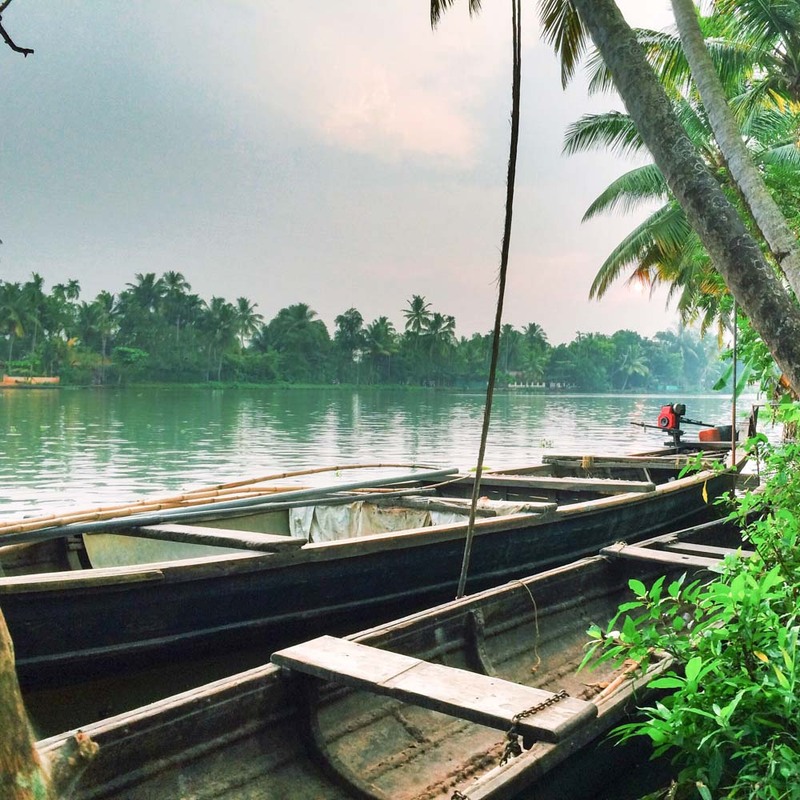 We did chose two things to do in Alleppey – a traditional houseboat tour and a homestay in the backwaters. Both were highlights of our trip. It is also possible to get a houseboat from Kollam but we chose Alleppey because the choice is much greater there. We believe we found the best houseboat in Kerala. In our opinion, Greenpalms Homestay is an unmissable part of Alleppey. Transport: We travelled to Alleppey from Varkala by train which took about 2 hours. We got a tuk-tuk to and from each train station to our hotel.Once in Alleppey, I recommend seeking out a tuk-tuk driver named Kabeer who helped us find a houseboat and also took us on a very scenic route to Cochin. Kabeer can be reached on 9895860674 or kabeerkj3@gmail.com. When we heard that Amma, the hugging saint, was in residence at her ashram in Kerala while we were there, we knew we had to go. We’d both read about her and were intrigued to see what it was all about as people often name is as a Kerala highlight. The ashram is an interesting trip in itself, but if you’re lucky enough to be there when Amma is then don’t miss it (you can see her schedule online). She only gives hugs (also known as darshan) on certain days so be sure to check in advance and perhaps book a bed at the ashram if you can. It’s also worth taking a tour while you’re there to get an understanding of Amma’s history and all the charity work she does. If you want to stay at the ashram for more than a night, volunteering in some way is encouraged. Transport: To get there, we took a bus from Alleppey to Kayankulam bus station and then a tuk-tuk to the ashram from there. We would have gone en route from Varkala but the timing was off and we wouldn’t have been able to receive darshan. If we had chosen to travel from Varkala, we would most likely have got the ferry from Kollam, which makes a stop at Amritapuri en route to Alleppey (this ferry doesn’t run all year so be sure to check ahead). Before we went to Kerala, a lot of people raved about how beautiful Kochi is. When we arrived we were pretty disappointed to find a rather shabby beachfront with industrial views, but that was before we started wandering around the town and stumbled across the beautiful Bazaar Road. The crumbling colonial architecture is so photogenic that I stopped to I snap a picture every few steps. 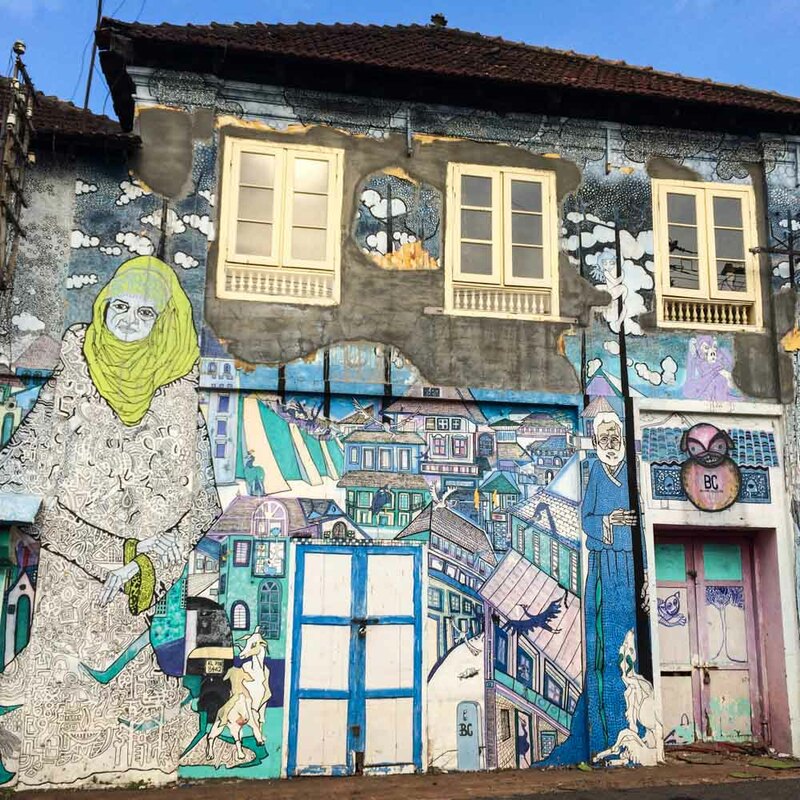 Kochi is also notable for being an arts hub in Kerala. The Kochi Biennale was taking place while we were there, and lots of street art can be seen all around the city. Many people also visit to see the famous Chinese fishing nets. We stayed in a hostel (Dreamcatcher) that we found a bit unfriendly. Friends have recommended Greenwoods Bethlehem, the Old Harbour Hotel, and Sajhome. Transport: If going to Kochi, you’ll most likely arrive / depart from Ernakulam, which is its much bigger neighbour. This can be reached by a 20-min ferry or a 30-min car ride. We took a tuk-tuk all the way from Alleppey with Kabeer who I also mentioned in the Alleppey section. After Kabeer helped us to find a houseboat in Alleppey, he showed us a book filled with compliments from previous customers. We noticed that lots of people had praised his route from Alleppey to Kochi where he takes the quiet coastal road and stops along the way at various sights and beautiful beaches. It was more expensive (1000 IDR) than taking the bus but well worth it for the things we saw (Chinese fishing nets, a church in the shape of a boat, crafts villages and Marrari beach). Kabeer was also great company. His contact details are above in the Alleppey section. Wayanad is a hill station in Kerala and a much less travelled one than Munnar which is firmly on the tourist trail and a highlight of many Kerala itineraries. It took us a long time to choose between the two, but in the end we went with Wayanad because it was more convenient for our route and it seemed to have more to offer (wildlife parks as well as tea plantations). Many people say that the tea plantations in Munnar are more impressive than those in Wayanad but we were plenty impressed by what we saw so didn’t feel as though we missed out. We also liked how quiet it was and the landscape all around was stunning. We’ve posted a photo essay as proof. We stayed in a lovely homestay called Enteveedu run by a wonderful woman named Seetha who is on hand to offer advice on anything you’d like to do. It was conveniently located in the centre of Wayanad so everything was in reach. Some people choose to stay in the main town of Kalpetta but we preferred to stay somewhere a little more rural. There are also lots of luxury accommodation options in Wayanad where you can stay in incredible tree houses but our budget didn’t allow for that this time and we were happy with the homestay. Transport: We got to Wayanad by taking a train to Calicut from Kochi and then hiring a driver from there. I’m a complete wimp when it comes to winding, hilly roads and the one to Wayanad from Calicut has a total of 14 hairpin bends and hair-raising drops so I didn’t fancy taking the bus. It would have been a much cheaper option but I decided that my nerves were worth the 2500 rupees. The journey takes around two hours. Kannur is most famous for its Theyyam rituals. A girl we met in our hostel was staying there for six weeks to explore the rituals in detail. We were only there for one night and the timing was off so we could only see a short ritual preparation, which was fascinating nonetheless. Kannur is also a brilliant destination if you’re looking for unspoiled, deserted beaches. We stayed in the Thottado beachside area at a hostel called Costa Malabari, which is really close to the beach and run by a man who has a lot of knowledge about the Theyyam rituals. We also heard good things about Waves Resort. Transport: Our next stop after Kannur was Goa, which made for the longest journey of our entire trip. We originally planned to get an overnight train but we left the booking too late so the only overnight option available was a train that arrived to Goa at 4:30am. When looking for direct trains from Kannur to Margao it seemed as though there were very few options, but then we realised we could change at Mangalore, which increased the options hugely. In the end, we decided to travel during the day as we wanted to be able to see the changing landscape. It was a 10-hour journey and we had to get a tuk-tuk from Manglore Central to Mangalore Junction (about a 15 minute journey) for the change. We went in the sleeper class, which was really comfy and we both loved spending the day reading and watching the world go by while drinking lots of chai. Panjim is the capital of Goa and famous for its Portuguese colonial architecture. We just spent one night there but enjoyed wandering the streets looking at the colourful buildings. We stayed in a particularly lovely hostel in Panjim called the Old Quarter, which I’d highly recommend. Transport: Panjim was out first stop in Goa and we got there by taking a train all the way from Kannur to Margao and then taking a taxi from there to Panjim. Overnight trains from Kerala to Goa get booked up way in advance but we realised we could get a daytime train by changing in Mangalore. This involved getting a tuk-tuk from Mangalore Central to Mangalore Junction. Our next stop after Panjim was Vagator and while we could have got a bus to Margao and another bus from there to Vagator, we opted for a taxi instead. 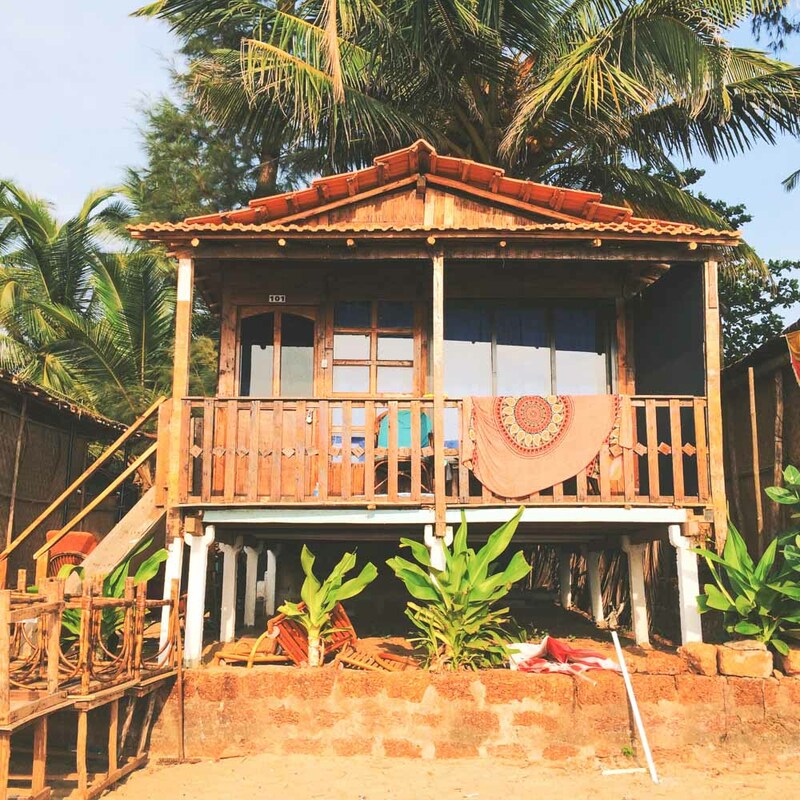 We nearly didn’t go to north Goa as it didn’t sound like our scene but curiosity got the better of us and we decided we wanted to see the classic hippy vibes. It’s northern Goa that earned the region its reputation as a raving capital and became famous for its hedonistic beach parties and hippies that never left. It’s a long way off the old days now and a lot more commercial / backpacker, but certain parts retain the hippy essence and there are parties to be found if you keep your ear to the ground. There are also at least a few stragglers from the 60s. We stayed in Vagator for one night in a beautiful hillside bungalow at Alcove Resort. The view across the beach was gorgeous but there was a massive party in the place right next to us so sleeping was an issue. That’s why we chose to stay away from the beach in Anjuna for the remaining two nights. The cliff top that runs above Vagator is filled with lots of lovely restaurants and bars. We particularly liked Thalassa, which is a little pricy but worth it. Travel: The roads around Anjuna and Vagator are pretty quiet and everything is really spread out so many people hire scooters / motorbikes. We didn’t but we would have done had we been there any longer. Instead we mostly walked or got local taxis (taxis aren’t cheap and they’re not very open to bargaining). We spent our second two nights in Northern Goa in Anjuna, staying at a charming guesthouse called La Vie en Rose run by a lovely French lady called Michelle who has lived in Goa for more than twenty years and taken in around nine stray dogs and cats. It was a lovely place of respite away from the trance music that plays day and night on Anjuna / Vagator beach. One thing that makes northern Goa well worth visiting is the Saturday Night Market, which is one of the best markets I’ve ever been to. Set into a hillside, it’s a fabulous set-up with layers of shops and food stalls set around a central stage with live music. Alongside lots of the usual stalls selling Ali Baba pants and silk scarfs, there are also lots of individual boutiques with unusual handmade jewelry and clothes. We did nearly all our Christmas shopping there! There is also the famous Anjuna Market which takes place on Wednesdays. Other places we’d have liked to see in northern Goa if time had allowed were Arambol and Mandrem, which sounded both quiet and hippyish. We were happy to avoid the package holiday destinations of Calangute and Baga. We chose to spend the end of our trip in Patnem as we wanted a final week of beach time to relax. Patnem was the obvious choice as so many of our fellow bloggers had recommended it as a chilled out alternative to the north of Goa or even the neighbouring Palolem. It turned out to be ideal especially because the sea is so calm and therefore perfect for swimming. At night, Patnem is particularly picturesque when all the beach front restaurants put out tables lit with candles. If you’re looking for something a bit more lively then you might prefer Palolem. We went there a couple of times but were happy to retreat back to Patnem after the parties. We stayed in Om Shanti bungalows but there are plenty of options and all seem pretty similar. I’d recommend waiting until you get there and then just asking around. We were told to book ahead for the Christmas period but in reality there were plenty of places available and you save money by booking on the spot. Transport: We barely left Patnem beach so didn’t need transport very often. It’s about a 20-minute walk along the coast to Palolem and you can also get a tuk-tuk for very cheap. The only other time we got a tuk-tuk was to go to the local ATM as there isn’t one in town (it’s just a 5-minute drive away). Canacona train station is 10 minutes away and has trains to all along the coast from Kerala to Mumbai and beyond. You can also get buses from there or Palolem to North Goa and many other destinations (Kerala, Hampi etc). This wildlife sanctuary is a popular place to try and spot tigers but we decided to try our luck (unsuccessfully) in Wayanad instead. 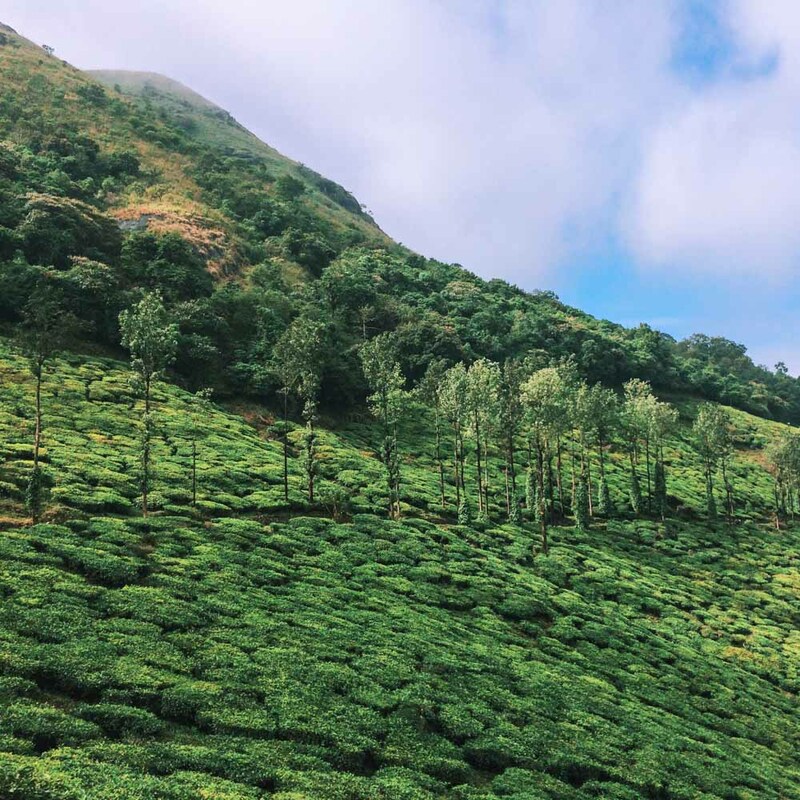 We didn’t go to Munnar, opting for Wayanad instead, but it is highly recommended for its stunning tea plantation views and is a stalwart of the tourist trail. Gokarna is a popular beach town between Kerala and Goa in the state of Karnataka. It sounding tempting but we decided to stay put in Patnem instead. 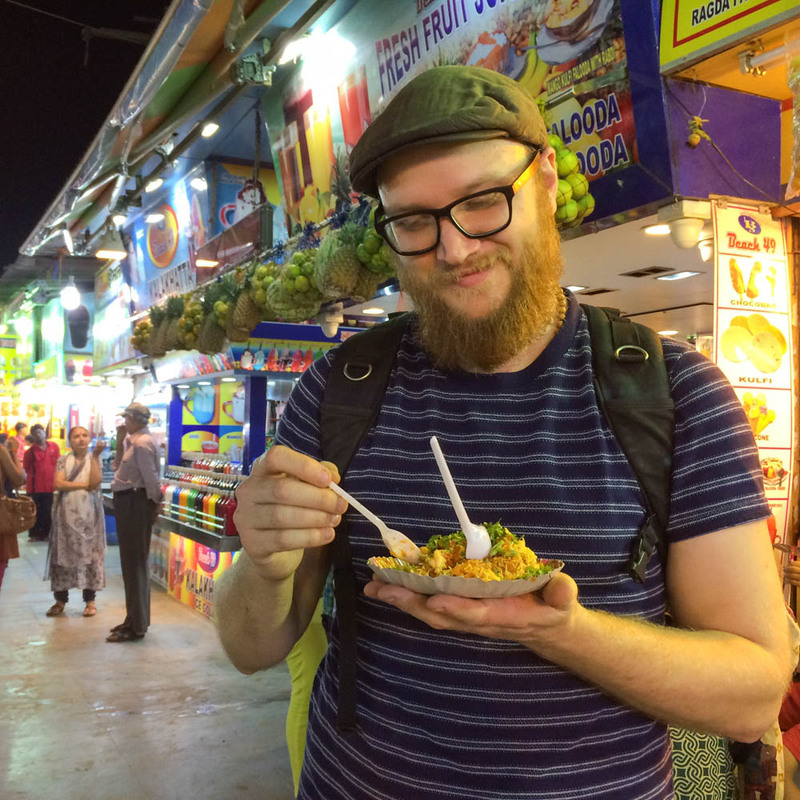 Never Ending Voyage – Erin and Simon’s first blog, before the days of Never Ending Voyage, was entirely dedicated to Kerala so they have lots of useful tips. 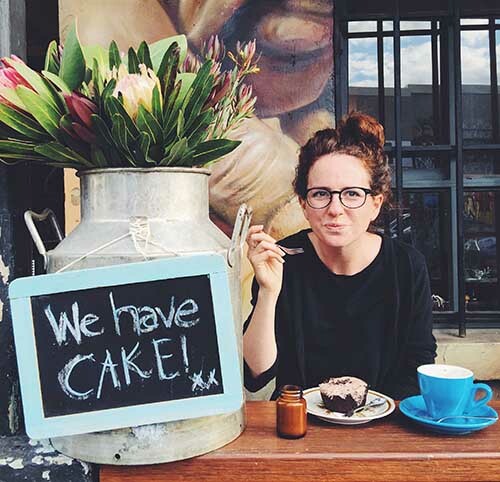 Globetrotter Girls – Useful tips on how to book a houseboat. Without reading this, we may have got a houseboat from Kollam instead of Alleppey, which I think would have been the wrong choice. 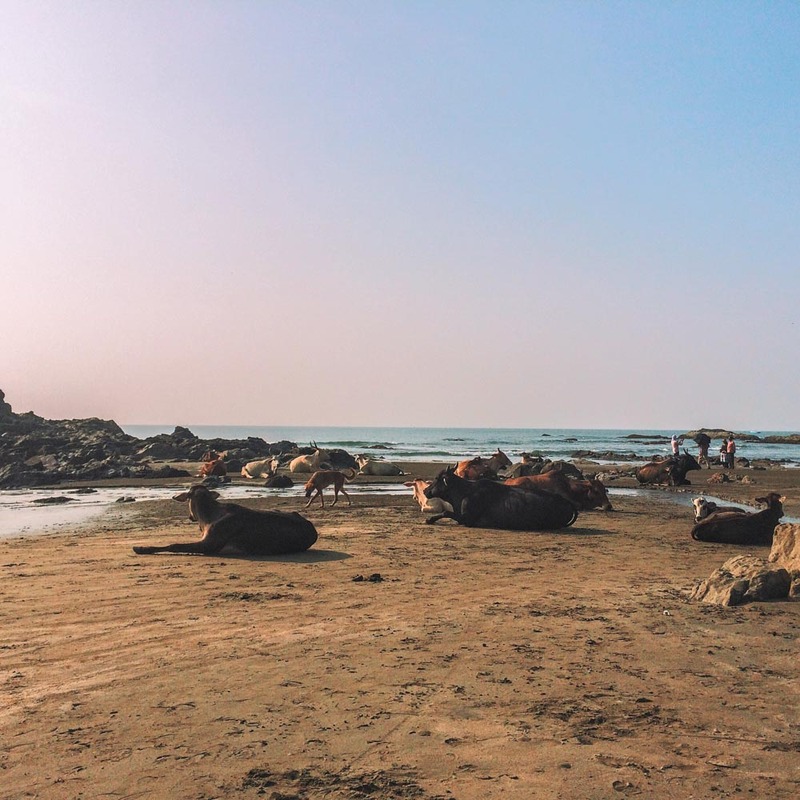 Further Bound, So Many Places and The Great Affair – Hannah, Candace and Kim have all spent time in or around Patnem, which is one of the main reasons to went there. Hippie in Heels – Rachel lives in North Goa so has lots of useful tips and recommendations. Feel free to add any of your own tips in the comments below. If you’re planning a trip, don’t miss our travel planning pages. We have tips on everything from saving money to health, to travel insurance. And if you want help choosing a backpack, we recommend the Osprey Kestrel 58. And if you want specific country tips, we have full, detailed itineraries for How to relax in Goa and Kerala; The ultimate South Africa honeymoon guide; How to make the most of 10 days in Japan; Finding hygge in Copenhagen, 48 Hours in Dublin, five days in Iceland, and more. See all our itinerary posts here. Fantastic post and beautiful trip, one I would not mind emulating some time in the future. Good luck! Even I think you shouldn’t have skipped Hampi. But anyway, it’s an excuse to revisit India! 🙂 Sounds like you had lots of fun in Kerala and Goa. I too went to Goa recently and enjoyed the old quarter in Panjim, beaches of North Goa and the countryside of South Goa. This is a great reminder that one of the reasons why people travel is to just sit down and relax. Your itinerary, though massive, is just so soothing and relaxing. A slow-paced travel in quiet sites will be just the thing for finding inspiration and renewing the soul. Thanks for sharing your experience, looking forward to the next blog post. It does, doesn’t it? I loved that book so much. Yes, Munnar was definitely tempting. It was so hard to choose between everything! This sounds idyllic! India has been on my radar for ever but I’ve still not made it… this post has me more tempted than ever! when U visit again India pls. be informed. how much money do you think i would need to do a simuliar trip for a month. Hampi is in karnataka not in kerala or goa. Thank you for your blog! I have Mumbai flights booked so far and are going for a similar amount of days as you- so your itinerary sounds perfect for me to use as a base! Love it! hello, i have looked but can’t find your write up of your time at Amma’s ashram. can you point me in the right direction or give me the highlights? Where did you stay in Kochi? Can you remember? We found the place we stayed (Dreamcatcher) in Kochi a little unfreindly so I didn’t recommend it here. Sorry! Love your blog! I understand you aren’t in the business of planning others’ vacations, but I’m having a hard time making a decision and thought it couldn’t hurt to ask. If you had 6 nights in Kerala and want a quintessential trip but not too much hopping around, would you pick the backwater homestay and a hillstation destination, or the backwater homestay and Vakarta, maybe each with a night in Cochi? Thanks for letting me know it was helpful. Have a great time! 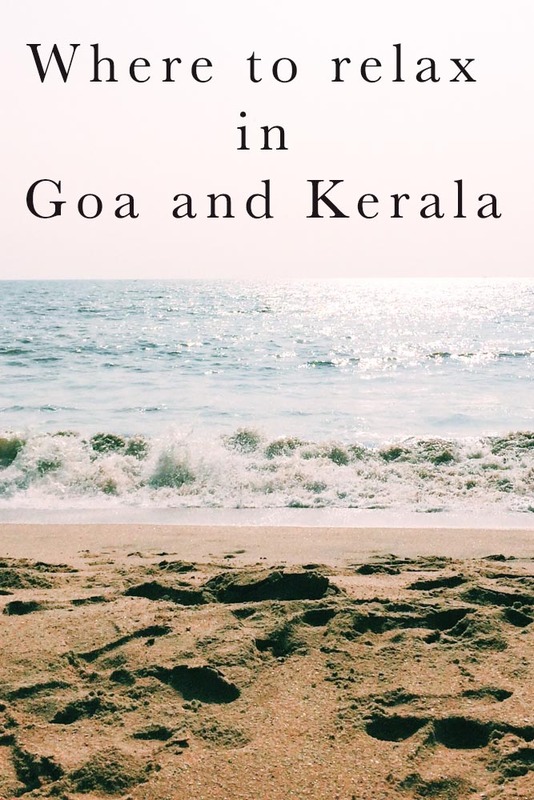 Kerala truly is my happy place – I LOVE reading about other people’s positive experiences there, and I literally recommend it to EVERYBODY looking for a less intense intro to India. It makes me so so happy that it gave you everything you were hoping for there! There’s something truly special about South India I’m yet to find anywhere else. Wow, what a detailed post! Thank you so much for this. I’m heading to Goa and Kerala in 6 weeks time and was struggling to know exactly where I wanted to go. This has helped massively! They were both very different experiences. The boat was pure relaxation whereas the homestay gave a taste of real backwater village life. I’d recommend both. Have a great time! You explored so many more places than I did in Kerala! But that state is wonderful, isn’t it? 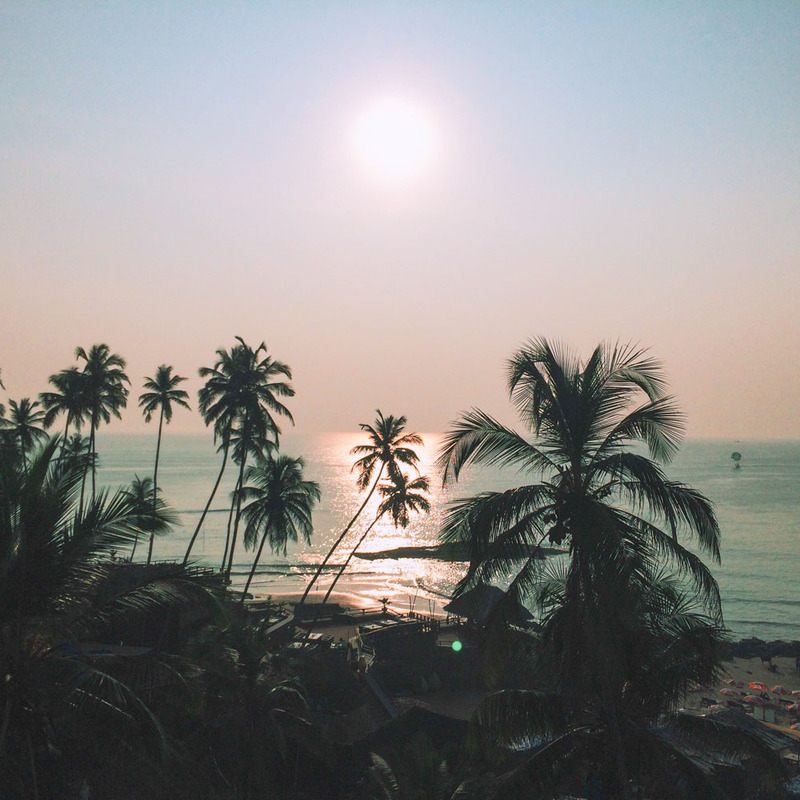 I have yet to go to Goa, but Kerala absolutely surprised me and I loved it there! Hi there! This sounds like such a perfect itinerary. Thank you for sharing your experiences. We are considering a trip to Kerala with our nearly 2-year-old. Now that you have a kiddo, could you imagine doing a trip to Kerala with one in tow? We used to be avid travelers, but haven’t don’t it since our son was born and I can’t picture how we’d handle him running around everywhere and needing naps each day. I’m not sure how old your baby is, but if you have any thoughts or tips I’d appreciate them! I think it really depends on what you’re comfortable with. For out first trips with Otis, we’ve chosen pretty easy places like Barcelona, Croatia and California. But he’s only seven months. Once he’s nearly two, I hope we’ll feel more confident. With that in mind, I would definitely consider Kerala as it was relatively easy place to travel around. I might just add a few more stops to break up the journeys a bit more. Plenty of people do go to places like Kerala with kids. However, it’s hard to predict how I’ll be feeling in 2 years or how Otis will be, so it might be that I’d still choose something easier! Good luck wth the decision! Alleppey is the best place in kerala. personally i like anjuna beach in Goa.